I know some of you are waiting for my China trip posts, but I am afraid I just have to blog about what I ate during Mooncake Festival last weekend before it becomes a distant memory. While everyone blogs about mooncakes, I decide not to. Besides, I did not eat a lot of mooncakes this year because they do nothing to my bottomline and my waistline! Instead, I thought I would like to share with you what I eat without fail during Mooncake Festival every year. No, it's not mini chocolate bars! Although, I ate them last week as my brother bought a huge packet of these mini bars when he came back from his holiday in Langkawi. There were Mars, Snickers, Milky Way and Bounty. Which one is your favourite? I think I like Snickers the best! But Bounty with its coconut fillings were not too bad! Me and my sweet tooth! Haha! And no, it's not chocolate cake either! As if the mini bars were not sweet enough, I also ordered this chocolate cake from PJ Hilton. Well, thanks to blogger TZ who posted about this special offer from PJ Hilton and also thanks to the sweet tooth in me, I just could not resist buying it! The 1kg chocolate cake which normally sells for RM65++ is now selling at only RM25++! Yes, you read that right! PJ Hilton is offering this as part of their 25th anniversary celebration. So if you like chocolate cakes, quick! Call PJ Hilton at 03-79559122, ask them to connect you to Paya Serai coffeehouse and place your order! In my opinion, the cakes were very chocolatey, moist and just at the right level of sweetness. However, make sure you don't cut the cake into slices and leave them in the fridge to prevent them from getting dry. Only cut the cake when you want to eat it. I'm sure both the mini chocolate bars and this chocolate cake must have raised my blood sugar sky high! Not to mention adding the inches to my waistline! Must work out really hard this whole week! So much for not indulging in mooncakes!! LOL! So if it's not mini choc bars and chocolate cakes, what do I eat every year without fail during Mooncake Festival? Well, it is taro potatoes! Have you eaten them before? Here's a close up shot. I love to eat these potatoes! From the above photo, it looks as if I have taken a big bite out of that taro potato including its outer skin. Actually, I did peel off the skin but after peeling halfway, I could not wait so I just took a bite! Haha! So greedy, me! Of course, I did eat some mooncakes. How could I not eat any mooncakes? It's Mooncake Festival after all! haha! But nothing too fancy this year. Just a Sushi King mooncake! And I didn't even buy it. Was given to my family as a gift. How was it? Well, it was not too bad. Of course you cannot compare it with those mooncakes from very established brands. Next year, I may want to get those lovely durian mooncakes from Shang Palace in Shangri-la KL. I ate one piece at a friend's mooncake party and I instantly fell in love with it. Hmmm, yummy!! Waaa I am too late! No FC again! So hard to be FC here, foong T__T. Yet to find my sweet tooth. The taro potato looks good. So you simply "taruh" and wallop the taro potato too kan cheong to wait any longer. Waaa Sushi King makes mooncakes now! Waaa so much chocolate bars! I want.. I always love Snickers...yum yum. Hilton got promotion ar... on all sorts of cakes? Must go check it out then! But to go get it so far T_T. Makes me lazy hahaa! You are sharing a piece with me right? haha. Hmm... if we can come out with some soft of weight-losing mooncake, we can make money. wah!!!! the taro potato is so cute lah!!! i didn't have any 'traditional' mooncake for on the day too, but i have some mini choklud mooncake. @KS: errr weight loss mooncake as in..less-fat mooncake or those the more u eat the more u lose kinda mooncake? I like Bounty the most. fooyuh!! that chocolate cake is damn tempting!! must be very nice since it's from hilton - i believe hotel bakery should have standard.. i don't really fancy chocolate cake, but if it's those kind of moist and rich chocolate, i would love them..
halu foong! so yummy those chocos! indeed mouth watering! I don't like chocolate bars (mars, snickers etc). I only like dark and bitter chocolates. I like plain chocolate cake that isn't too sweet. The cake (at RM25) is a very good deal. I feel the best mooncakes are still those non-halal ones. These days, people buy mooncakes for their packaging too because the containers are getting more and more fanciful and attractive. I like those mini-yams. They have them all-year-round now. Your mom didn't get any 'ling-kok' (the English equivalent escapes me)? I didn't see them in the supermarket though this year. RM25++ is a good price. Not many bakeries make great moist chocolate cakes. I like mine from La Manila. Their Blueberry Cheesecake is to-die-for too. got deliver to Johor or not ar? heheh..
da choc cake is only 25buck???? You stay in Shah Alam? Not that far what! Not all cakes, only the chocolate cake has promotion for the 25th anniversary. How to share a piece of durian mooncake with you? It's already inside my stomach and probably out already this morning. Hahaha! khengsiong, yes! Start brainstorming for the weight losing mooncake recipe now!! And we shall start selling 3 months before Mooncake Festival next year! Then you can quit you job and I quit mine and we can go vacation for the rest of the year. LOL! I think Khengsiong meant the less fat mooncake, but if it's the more you eat, the more you lose mooncake, then even better! Sure will be a hit! And both Khengsiong and I will be millionaires before year 2010 ends. LOL! betchai, I am hungry too looking at my own pictures! Haha! che-cheh, yes I did not even know it until I received this Sushi King mooncake gift! Now everyone is jumping onto the mooncake bandwagon cos it's HUGE $$$$!! SK, you like Bounty too? Yes, a little too sweet to finish up 2 bars! But I ate 1 Bounty, 1 Snickers and 1 Mars at one go! Habis!! No lah, I didn't finish up all the mini bars, though it is a process in the making... haha! The Hilton chocolate cake is chocolatey and moist - you will like it! Ask TZ if you don't believe me! Unfortunately for the Sushi King mooncakes, there is no wasabi or unagi inside! Only gulp in one little piece of taro potato? I ate a whole plate (equivalent to 20 or more taro potatoes!) Haha! manglish, yes the Hilton cake is definitely a good bargain - go get it if you love chocolate cakes! Sushi inside the Sushi King mooncakes? I don't think it will taste good, but if the chef can be creative enough, who knows? Oh! The Shang Palace's durian mooncake is heavenly. But very expensive, at RM14 for just one tiny mini mooncake! Still, I must get it next year - by hook or by crook! LOL! lina, eat taro will give you gas? Is it the same effect when you eat potatoes and yam? Ooh! Must have enjoyed your mooncakes! Green tea mooncakes, is it? No I didn't eat low sugar mooncakes, cos I prefer high sugar ones. hahaha! mei teng, yes I did some workouts this morning as a matter of fact and will do more tomorrow! LOL! I like dark and bitter chocolates too, but I don't mind indulging in sweet chocolate bars once in a while. Yes, the Hilton cake is a very good deal! Hmmm, thinking of buying another one this week. But then, it would mean double work outs! Damn!! happysurfer, the non halal ones are very aromatic right? But nowadays, they are coming out with more and more halal ones to cater for Muslims market. Yeah, I also like some of the more creative packaging. Looks like we are paying not just for the mooncakes but the packaging as well! The taro potatoes are available all year round? Really? I always thought they are only available during mooncake festival! So it's cheaper during other times? I used to eat "ling kok" when I was small. But it takes too much effort to break the shell and it's not that tasty, so I stopped eating it long time ago! Haha! Blueberries cheese cake from La Manila is good? OK, will try it out next time. I used to buy most of my cheese cakes from Secret Recipe, though I find they now jatuh standard already. Wonder what happened to the Secret Recipe of yesteryears? dolly, you pay me RM50, I buy the cake and deliver to your address for free! LOL! annant, can lah if you pay me RM65. LOL! I thing both Snickers and Mars are equally great! :p So you ate all these during the Mid Autumn festival? There are three types of cakes that I'd buy from La Manila. Their Blueberry Cheesecake, their moist American chocolate cake and the now discontinued Black Walnut Torte, the last one, you can't get it anywhere else but too bad it's no longer on sale. Also, I'd recommend their brownies - really yummilicious! I used to buy them by the tray. hehe..
they're called taro potatoes meh? I love Bounty but got to agree with you that Snickers is the best! We only got the green tea mooncakes from Equatorial. No green tea mooncake from the office contacts. There was a yam one, but I gave it to Zaini. No, no, no. Too high in blood sugar. BTW, I had booked the ticket. Remember to check in a luggage. O ya, not to forget to book an online meal too, as I don't want to be too rush like last time. Now I am thinking of spending a few days on one of the islands off coast of Terengganu after coming back from Cambodia. What do you think? i love all the choc esp the bounty..
Hey Bro, you go 'treat or trick' like halloween around your neighbourhood during mooncake festival ah? So many chocolate bars! taro potatoes?? never heard of it.. but they look yummy.. haha..
i love chocolates but those choc bars are not my cup of tea Foong. the cakes looks tantalizing though. can i have a slice please? i haven't tasted taro potatoes. i wonder how it tastes like. i didn't eat much mooncake too :P but just few of them. i like the lemon and the egg ones. er, snickers make me fat! LOL. i skip that one. i never try that taro potatoes. different from other potato? choc cake is my favorite of all time! hehe send some here will ya? Aiyar yeahlor what a narrow miss! Shah Alam? No I do not stay in Shah Alam :P.
Chocolate cake only? Oh ok.. I am not fond of Chocolate cake.. not much of a chocolate fan hehehe... Oh Yes I got a sweet tooth! But I don't fancy too much chocolate :P.
Snickers is yummy! I like the caramel inside :P.
Too bad u don't stay up here in Pg or else I can offer you some of my homemade chocolate mooncakes. Looks like you had a really sweet Moon Festival! tekkaus, yes, I ate the choc bars and cake in addition to the Sushi King mooncakes and the taro potatoes during Mooncake Festival! The cake is priced at RM25 in conjunction with PJ Hilton's 25th anniversary. It is fresh and you have to book the cake in advance. Haven't tasted taro potatoes before? I thought it's quite a popular food during Mooncake Festival! angie tan, no mooncakes for you too? Well, replace them with Bounty and Snickers, which are equally fattening! Haha! lina, greentea mooncakes from Equatorial? Is it expensive? I was hoping to get some mooncakes at 50% off after the Festival. No such luck! kenwooi, why you didn't play with lanterns this year? Becos you are a big boy now? Haha! life ramblings, if we meet up, I can always pass you a slice of the cake, no problem! faisal, lemon mooncake? Honestly, I've never tasted lemon mooncakes before! 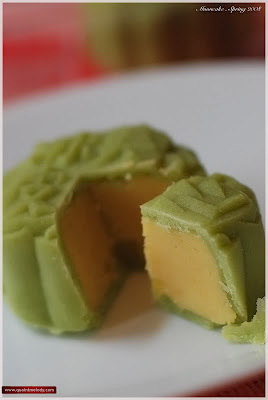 Some mooncakes have egg yolk in them, but they must still have the paste whether it's lotus, red bean, durian etc. etc. But I dislike mooncakes with eggs in them! Snickers make you fat? Actually, mooncakes also make you fat! Haha! Yes, taro potatoes are different from normal potatoes. More like yam. You don't like chocolate cake? Hmmm, most people like it! foong speaks her mind, you can always courier to me. Haha! Psst... going on holiday (again)? Cambodia this time? Angkor Wat.. Bila? Looks like you are becoming quite a globetrotter now. Life's little pleasures.. Enjoy! Yes, a fan of La Manila cakes for many years now. so chocolatey foong, so so tempting! so cruel of you! i like mars and milky way but i just eat it very seldom. I don't usually indulge with sweet treats. Snickers is good but i really don't like chocs with much nuts and carame in it. no mooncakes for me this year...not celebrated here and nobody gives around here too. maybe I should've went to san francisco chinatown to get some! hehe but too far from where i live. speaking of taro...yeah i also eat it but not very much available here. i also like purple yam and japanese yam. ayie, haha! Sorry about the temptation! LOL!